The Hilton Kingston offers stylish lodging less than one mile from the National Gallery and the U.S. Embassy in Kingston, Jamaica. 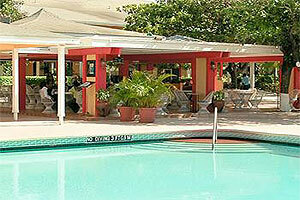 The hotel is also near the Bob Marley Museum, Devon House and downtown Kingston. Golf enthusiasts are within walking distance of a driving range and putting green, and seaworthy guests are 12 miles from the beach. Upon arrival at the Hilton Kingston, guests enter a spacious marble lobby and are surrounded by verdant plants and quaint sitting areas ideal for socializing. The pool area features sunny and shaded leisure venues and multiple towering palm trees. A poolside bar serves tropical drinks under a bright red canopy. Evenings bring live music and themed buffets among trees strung with red-and-white lights. The hotel also offers an air-conditioned nightclub, Jonkanoo Lounge, open several nights each week and featuring a variety of music. Multiple on-site dining options include breakfast buffets at Terrace Café, fresh sushi at Restaurant Japan and weekday dinners at Palm Court. After indulging at the buffet table, guests can exercise at the two-story fitness center complete with cardiovascular machines, weight-training equipment, aerobics classes, and men's and women's saunas. Other amenities include wireless Internet access, dry cleaning services and safe-deposit boxes.